Want a great gift for any time of the year? Body scrub. Not only does it sound yummy it feels absolutely amazing – it is and its for your body! There are so many benefits of body scrubbing. The benefits of body scrubbing falls in line with body brushing. Like body brushing, using a body scrub is another form of detox. Body scrubs exfoliate your skin, remove dead skin cells while promoting the growth of new skin cells. Body brushing and/or the use of scrubs will leave your skin with a natural glow, smooth, and supple. When done on a regular basis, some people notice a reduction of cellulite and stretch marks. Skin safe food coloring or juice from a beet. Directions: 1. Combine sugar and Fractionated Coconut Oil into bowl and divide equally into two bowls. In one bowl, add red food coloring until you get your desired color -or use the juice from a few beets. 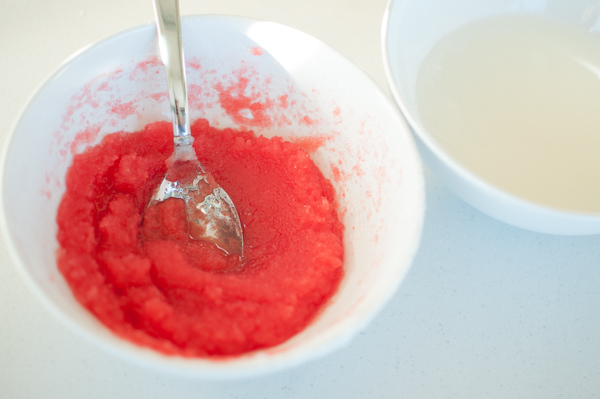 Layer the red and white scrub to create a ‘candy cane’ effect. Tie a cute ribbon and tag on the container and you’re done!